There are few tools that I have found are absolutely necessary in 3D printing; these items are kept in easy reach and each do a slightly different job. The Scotty Peeler (specifically the SP-2 metal peeler). It's intended for peeling pesky labels but it's absolutely wonderful for getting a print separated from the build surface of a filament-based 3D printer. For larger prints where the Scotty Peeler isn't long enough to reach underneath, once an edge gets lifted with the Scotty Peeler a larger scraper can be used to lever the rest of the print. Invaluable, inexpensive, and available off Amazon. Illuminated Magnifying Glass. Bought this at the dollar store. The plastic lens isn't the greatest, but the bright LED illumination makes up for it. Two AAA cells go into the handle and a switch turns on bright LEDs. I used to have a flashlight and magnifying glass together to illuminate and examine prints -- often while they were being printed. This all-in-one does the same job in a much handier package. 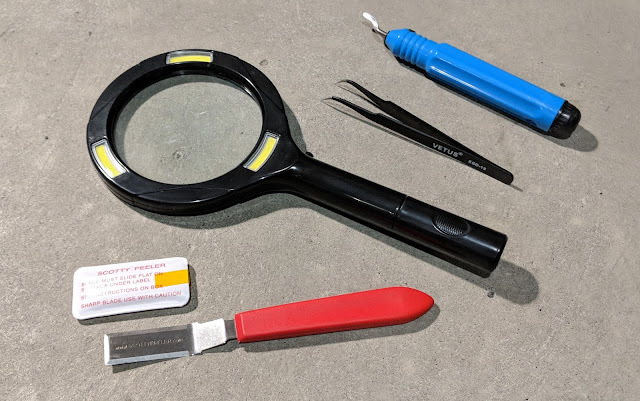 Tweezers are mainly useful for grabbing small bits and removing stray extrusions, like the bit of plastic from the nozzle after priming the hot end. Deburring Tool. This item has a specialized use but well worth having. I use it for cleaning up prints. Ever have an edge that needs trimming, for example the inside of a hole or the outside edge of a print, and you can't or don't want to sand it? A cheap deburring tool from your favorite offshore discount place is what you need. If you have never seen one it might look a little strange, but it's a knife that you pull instead of push. You stick the metal curved part into the hole or lay it onto the edge, and drag it along. The sharpened side will cut off a tiny amount of material while it pivots around as needed. It's great for quick and easy cleanup of edges. Lots of tools are useful but these have all found a niche for me. Especially the Scotty Peeler, that is absolutely #1 for me. If you 3D print and don't have anything like it, give it a shot!